Sheep Rock near Soda Springs is a major crossroads of history, geology and geography. Here the valley floor was lifted by two major volcanic eruptions that changed the course of the Bear River. The 55 mile Highline Recreational Trail starts here. The Oregon and California Trails made their first parting here and later the Oregon Shortline Railroad came through to serve the Northwest. The naturally carbonated water of Hooper Springs in Soda Springs was a delight to Oregon Trail encampments between 1840-1900 and still is to modern travelers. The wagons had traveled thirty miles that day from the previous camp at Clover Creek. They always celebrated having crossed the last of the Rocky Mountains. From there it was all downhill following the river to Oregon. 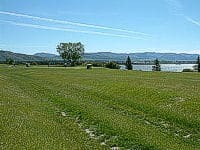 Visit the Oregon Trail Country Club Golf Course at Soda Springs where golfers can hit their golf balls right through the original wagon ruts still intact from the trail. The National Oregon/California Trail Center (left) at Montpelier makes a very good representation of the life on the Trail using movies, paintings, displays and live actors in period costume. The Center is located on the spot of the actual encampment. You can learn more about the historical migration across America of more than a half-million people who traveled to the Willamette Valley in Oregon in search of farmland and others who left the Oregon Trail for California in search of gold. The next encampment was at Fort Hall, a wooden stockade trading post on the present day Shoshone Bannock Indian Reservation. Pocatello has created the Fort Hall Replica to give visitors the opportunity to experience the past firsthand. It is located in upper Ross Park next to the Pocatello Zoo. From there they traveled along the Snake River to the next campsite at the present day Massacre Rocks State Park west of American Falls. The park has campsites for tents and RVs. The visitor center has a number of artifacts and diaries form early wagon travelers. Visit our Oregon Trail – Bear Lake Scenic Byway page for complete details and printable driving tour.